This article is step by step breakdown on how to assign vehicles when the reservation status is still on “Open”. 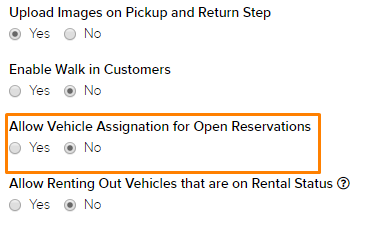 In this next step, set “Yes” under the “Allow Vehicle Assignation for Open Reservations” as shown in the picture below, highlighted in orange. After you have done so, click on the blue “Save” button located at the bottom as shown in the picture below, highlighted in orange. Navigate back up to where you were and you will notice that two additional items appear as shown in the picture below. You can set these two if you would like to automatically assign a vehicle to a reservation. The methods for automatic assignation are “least reservations”, “most reservations”, “lower odometer”, and “higher odometer”. Now, when you reach Step 5, you will notice a light blue “Assign Vehicle” button as shown in the picture below highlighted in orange. When you click on the button, a window will appear. Here in this window, you can select the vehicle that you would like to assign it to. When you have selected, click on the blue “Save” button highlighted in orange in the picture below. Doing so will take you straight to Step 7 where you can also confirm the reservation in this step. To learn more about reservations, follow this link here.